If you have children around, the garage can be a dangerous place with all of those hazardous bottles sitting around. 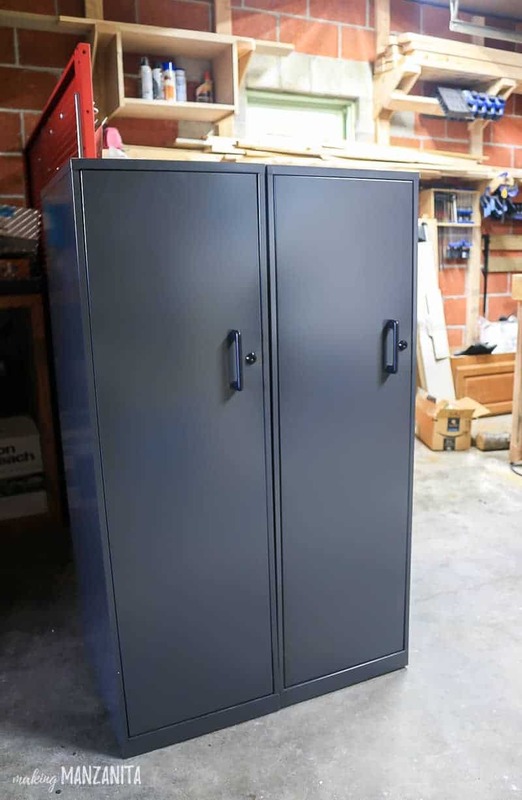 A locking storage cabinet can help to kidproof your garage. 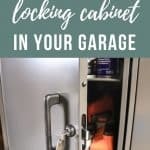 In this post, you’ll find a full list of what to put in a locking storage cabinet if you’re trying to kidproof your garage. Thank you to Hirsh Industries for sponsoring this post! All opinions are entirely my own. This post also contains affiliate links, but nothing that I wouldn’t recommend wholeheartedly. Read my full disclosure here. One of the many things we’ve been working on trying to keep clean and get more organized over the past several months is our garage! Since we moved in a year ago, things have always been kind of a train wreck out there. There are several boxes that still haven’t been unpacked because we’ve been renovating pretty heavily inside since we moved in. Last summer though, we did section off the back half of the garage to create a workspace for Logan. Over the last 4 years of renovation, we’ve accumulated tools for just about every DIY job out there, so we need some more storage space. One thing that Logan wanted to have space to set up was a table saw. More importantly, he wanted to build a large outfeed table for it. This definitely comes in handy when you are working with large sheets of plywood (which we used on the banquette bench & hallway cabinet). 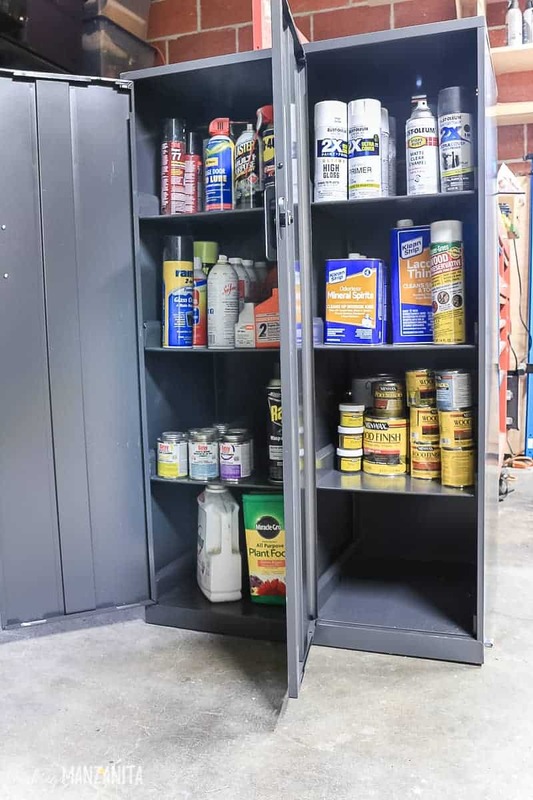 After spending months organizing and building storage for wood and miscellaneous things, we were left with a whole bunch of random bottles….paint, wood stain, glues, gardening chemicals and landscaping, car engine cleaner and oil, etc. Ya know, garage stuff. If you’re a mom and you just read that list of random bottles, you’re probably thinking on thing right now. Ahhhh…must keep away from the kids. You’re right. 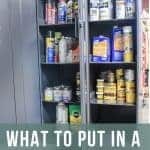 These things that we were left with are extremely harmful to kiddos and we needed a solution to kidproof our garage for these hazardous items. Did you know that according to U.S. Centers for Disease Control and Prevention, there are approximately 2 million poison exposures in the U.S. every year and 57% of them are children under 6. And 90% of those accidental poisonings happen in the home (source). That right there is motivation enough! 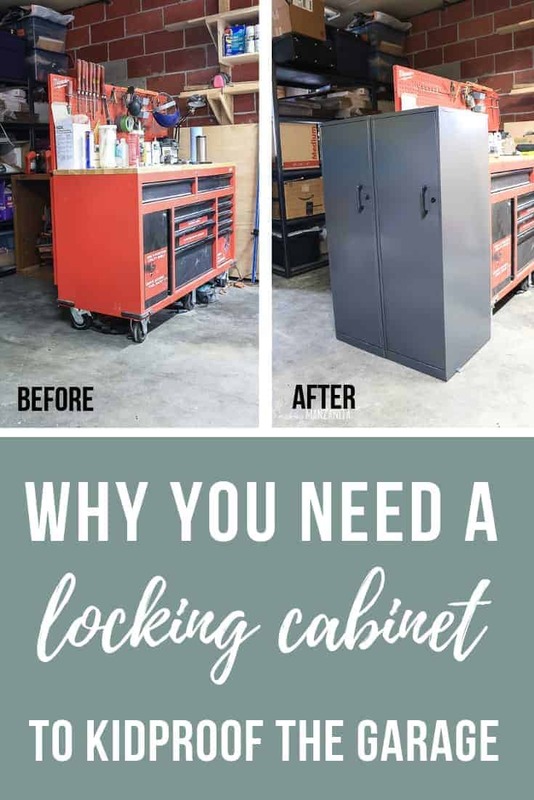 Why do you need a locking storage cabinet in your garage? You may be thinking to yourself…now, what kind of parent would let their kid roam around the garage unsupervised? Why do you need to kidproof your garage? I get it. And, for the record, we don’t give our kiddos free reign of the garage by any means. But you can’t have eyes on your children at all times. In addition to teaching children right from wrong…it is part the parental role to protect your kids. But as children get older, they get more curious. For instance, our 2 1/2 year old has now figured out how to open exterior doors. So….on goes the childproof door handles. But…like I said, you can’t have yes on your children at all times. What if he was to get into the garage from the backyard? Don’t have kiddos? It’s equally important to keep these chemicals away from your pets. Also, it is important to keep flammable products away from direct sunlight and in a cool, dark area! To calm my worries, it was necessary to start taking steps to kidproof the garage. So, when Office Dimensions reached out to me about these 4-Shelf Storage cabinets, I was in seventh heaven. The locking storage cabinet has made it possible to kidproof the garage! We cleared a space in the garage for the cabinets next to the workbench. 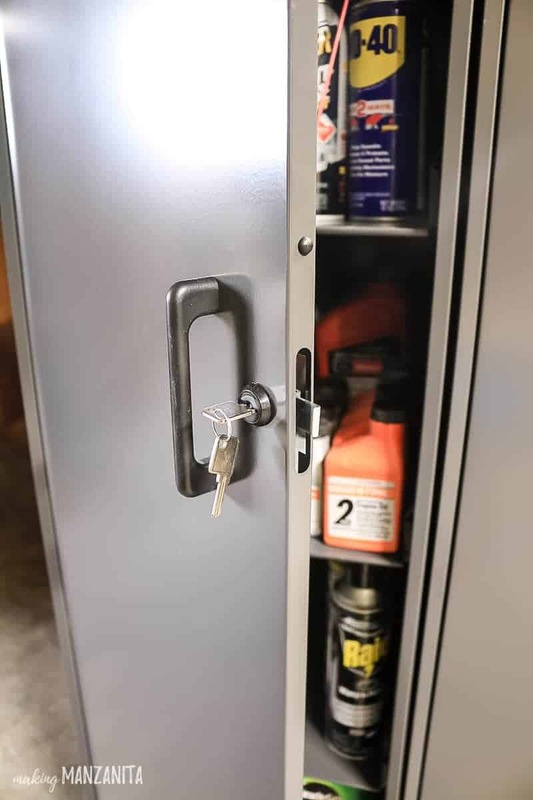 So…if you decide to get some locking storage cabinets to kidproof your garage, you may be wondering what kind of things you’ll should put behind a lock. Here’s a list to get you started…Generally speaking, if it is harmful and dangerous for my kiddos if they got ahold of it…it’s going in the locking storage cabinet. My favorite thing about these locking storage cabinets is the fact that they come shipped pre-assembled, which saves so much time! 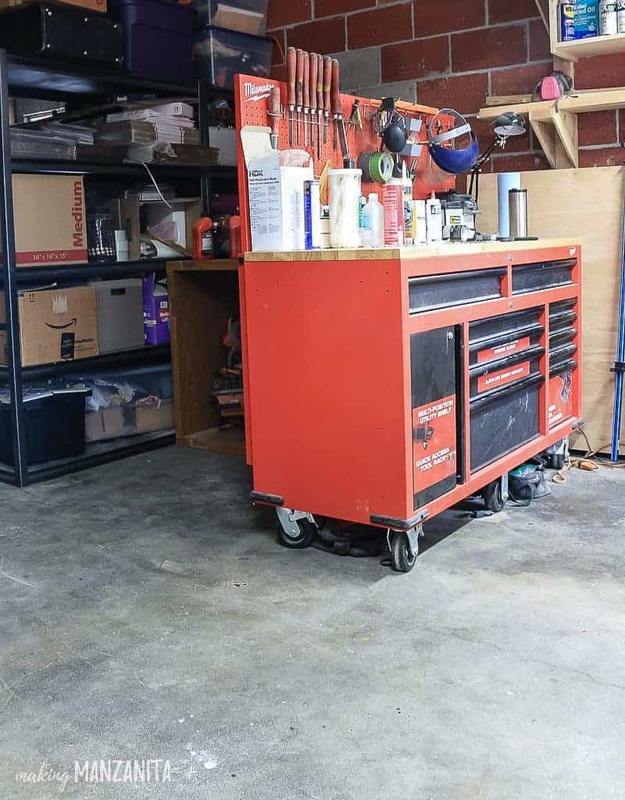 You can move right to organizing in your garage. 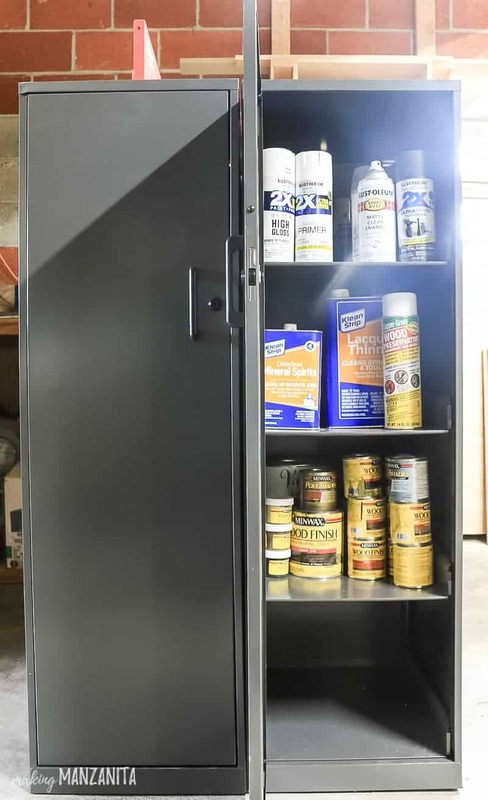 What to put in a locking storage cabinet to kidproof your garage? 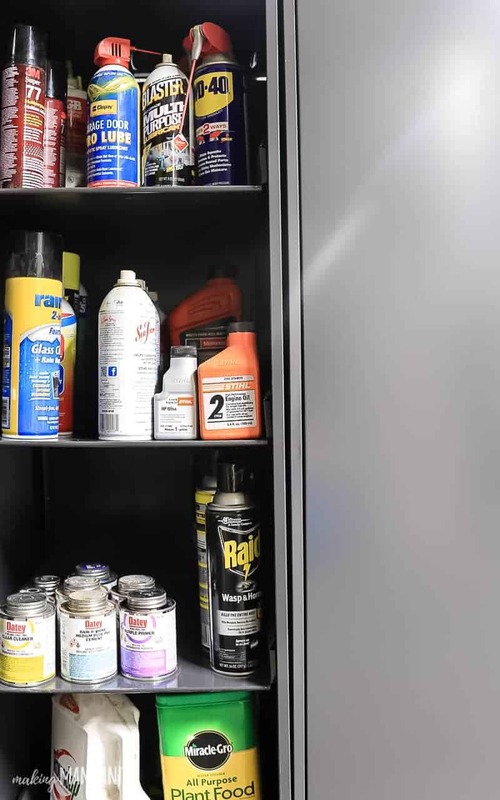 It is also important to note here that you should always always always keep chemicals like this in their original containers, whether they are in your garage or in your house! 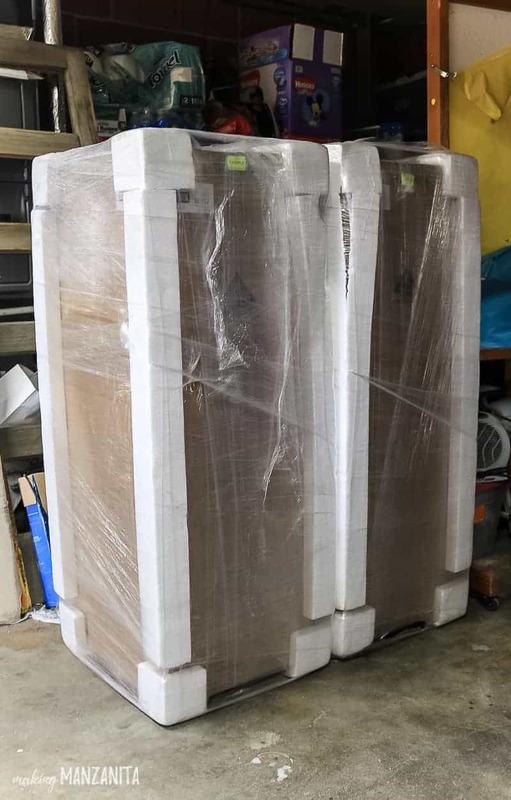 How much can these locking storage cabinets hold? 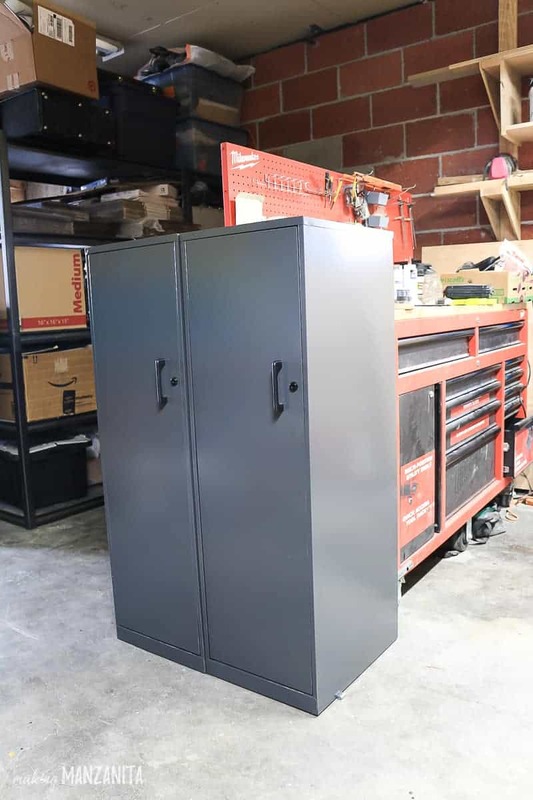 If you’re thinking of getting some locking storage cabinets for your garage, you may be wondering what size and how many you may need. Besides just looking at the general dimensions of the cabinets, I thought I would give you an idea of just how much these cabinets can hold. Now I have this 4-shelf storage cabinet, but they also have a smaller version with 3-shelves available too! It took us literally about 30 minutes to unbox both cabinets and then 15 minutes or so to organize and fill the cabinets. Less than an hour for a worry-free, kidproof garage. Yes, please. 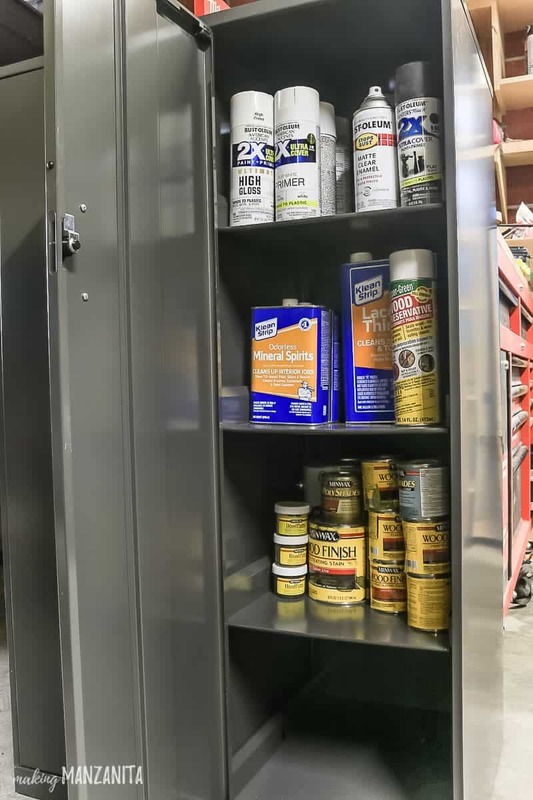 What would you put in a locking storage cabinet in your garage?